Ensure that your child receives the best of the breast milk that you express by using proper storing and preparation methods. In our previous issue, we talked about the issue on expressing milk and its different methods. In this final part, we will walk you through how to store your expressed breast milk properly and to prepare them for your baby. 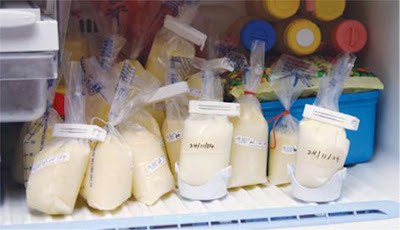 Enforcing the proper storing and preparation techniques is important to uphold the hygienic and nutritional properties of breast milk. Hard-sided containers. Usually made from hard plastic or glass, these are the preferred containers for long-term human milk storage. Choose one with an airtight seal. Plastic bags (specifically designed for breast milk storage). Only use this option for short-term use as they may spill, leak, or become contaminated more easily than hard-sided containers. Some important milk components may adhere to the soft plastic and deprive your child of it. Wash your hands prior to expressing milk. Store in small portions (2-4 ounces/60-120 mL) to minimise waste. Consider storing smaller size portions (1–2 ounces/30–60 mL) each for unexpected situations. A small amount of milk can keep a baby happy until mom comes to nurse the baby. You may combine breast milk expressed throughout the day to get the desired volume in a container. Chill the newly expressed milk for at least 1 hour in the main body of the refrigerator or in a cooler with ice or ice packs, and then add it to previously chilled milk expressed on the same day. Do not add warm breast milk to frozen milk because it will partially thaw the frozen milk. Also, do not mix milk from separate days. Leave some room at the top of a container because breast milk expands as it freezes. Label containers clearly with the date using waterproof labels and ink, if possible. Depending on maternal diet, the color of breast milk may vary daily (bluish, yellowish or brownish). Frozen breast milk may also smell different than fresh breast milk but there is no reason not to use the milk if the baby accepts it.